Powerful carbon neutral reseller hosting perfect for designers and marketing agencies, or people who just have a lot of websites. Includes IPv6, Let's Encrypt free SSL, Wordpress tools, and free migration. Reseller packages are based on disk space, data transfer, and number of hosted domains. Everything else is unlimited, expand the table or read further down to learn more about what's included. We generally find that Plesk is the most user friendly control panel, and the large majority of websites require Linux based hosting not Windows. However if you prefer cPanel or Windows hosting then you can select that instead at no extra cost. 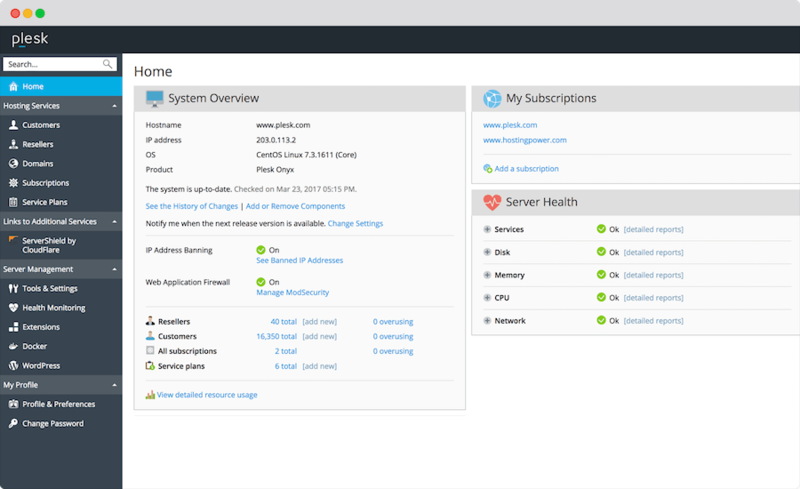 Plesk makes it easy to manage your reseller account, including setting up service plans, creating subscriptions and customers, and managing the services within accounts such as DNS, mail, FTP etc. With the Plesk control panel you can create individual logins for each customer so they can login and manage their account themselves within their own control panel. Secure your customers websites with SSL/TLS encryption for free using the built in Let's Encrypt functionality. Native IPv6 support is enabled by default for you and your customers, each account gets a dedicated IPv6 address and a shared IPv4 address. Dedicated IPv4 are available.